Approximately 91% of women in the United States are unhappy with their body appearance. Approximately 43% of men are similarly dissatisfied. Each day, we are bombarded with images of “perfect” men and women — in magazines, TV, movies, and on social media. It seems like we can hardly go anywhere without seeing headlines promising “drop 15lbs in just two weeks!” or flipping through magazines with Photoshopped and unrealistic female figures. Eating well and exercising regularly are healthy practices that can benefit each and every one of us. But when we make our bodies and our food the enemy, we have moved into dangerous territory. Due to the extreme metabolic management, Julie was diagnosed with Hashimotos Thyroiditis, an autoimmune disease in which the immune system turns against its own tissues. 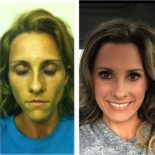 Four years after her final competition, Julie has developed three more autoimmune diseases that she believes are attributed to her extreme exercise and dieting days. Despite these negative implications, she has found a healthier balance in both mental and physical health. “As women, our bodies are not meant to be 8% body fat. I have learned that my body will not always be ‘stage ready’ and to embrace what I have,” Julie said. Although Julie still works out diligently, she has learned that she can stop when she is tired, eat when she is hungry, and not stress out about eating dessert and other special treats every now and then. “Food is fuel, you can’t starve a car of fuel and expect it to run efficiently. Listen to your body, it’s smarter than you are,” Julie advises. Raintree Athletic Club is committed to body acceptance and welcomes all levels of fitness, body types, and body sizes. Overall health and wellness is our goal. So wherever you are in your journey, know that our entire team has your back. Thank you so much for this. At one point in my life, I weighed 80 pounds (I'm 5'5"), and no in-patient treatment program could help me. I somehow saved my own life on my own. I sometimes still struggle with accepting my body. Angela - thanks for reading and for sharing your story. It takes extreme courage to put yourself out there and we're honored that you are sharing with us. Unfortunately, our culture makes it extremely difficult to constantly accept our bodies for what they are - vehicles to move through life and not ornaments to be looked at. Just remember that you woke up this morning and your heart was beating for a purpose. Feel your heart beat and know that is the most important part of your "body" and of your "being!" We hope to see you at the club soon.